Marriage is the unique blending of two people to compliment each others strengths and weaknesses. My husband and I have been married over 41 wonderful years. We have a good marriage but there are some differences between us. Gene is an early riser, I am a night-owl. By the time my head hits the pillow, I am asleep for the night. He counts sheep in the middle of the night. He is up prowling around, drinking coffee and doing office work during the best sleeping hours of the morning. But it doesn’t take long after supper for him to crash on the sofa, snuggled in his blanket. Of course he is not sleeping, he is watching TV! I on the other hand enjoy my morning snooze. I hit the floor running and allow just enough time to make my bed, get ready for the day and grab a bite to eat before heading out the door. The best part of the day for me is after supper. That is when I kick into second gear and can accomplish a day’s worth of work! I like Ranch & Italian dressing, butter, Pepper Jack cheese, water, leafy green lettuce and anything sweet. Gene likes French & Thousand Island dressing, margarine, American Cheese, tea, Iceberg lettuce and salty snacks. My favorite vegetables are edamames, fried okra, and raw vegetables such as cabbage, carrots, radishes, turnips, etc. He prefers snaps, corn, peas and limas. I think the biggest conflict of our marriage occurred over “time”. I like to be early and it did not seem to bother him at all to be late. We have managed through the years to settle into a comfortable routine. I have relaxed and he has improved! I can go, go go and he prefers to chill, chill, chill. I do not care for cats or dogs. In fact, I made him promise before we got married that we would not have an animal in the house. He loves his dog. He has to have noise when he sleeps such as a fan, TV or air-conditioner. I prefer it dark and quiet. He likes to “pile” and I am an organizer. Somehow this “piling” thing has rubbed off on me more than I like. I am a people person and enjoy teaching, speaking and being involved in many things all at once. He is at his best with one-on-one relationships and is very content to sit back out of the spotlight. I tend to say what I think and he thinks what he says. I tend to have good first-impressions of people but you can “lose” my favor. With Gene, he holds you on reserve until you earn his approval. Sometimes we take each other for granted but I wouldn’t trade our marriage for the world. Our home is a comfortable place for us to be. 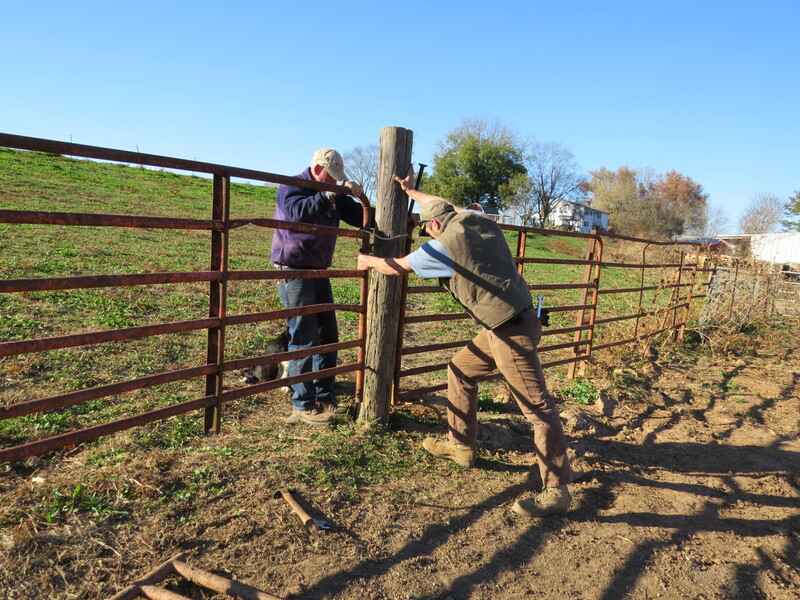 Gene has been working on his cattle pastures this fall, repairing old fences, building new ones, and hanging gates so that he has more field rotation options and better grouping of his cattle. 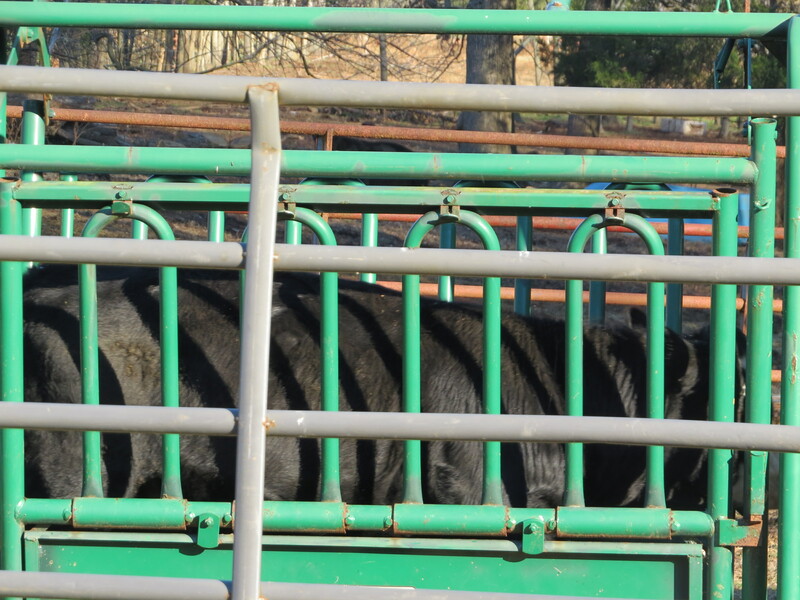 Today he brought in a group of young stock weighing 400-750 lbs. 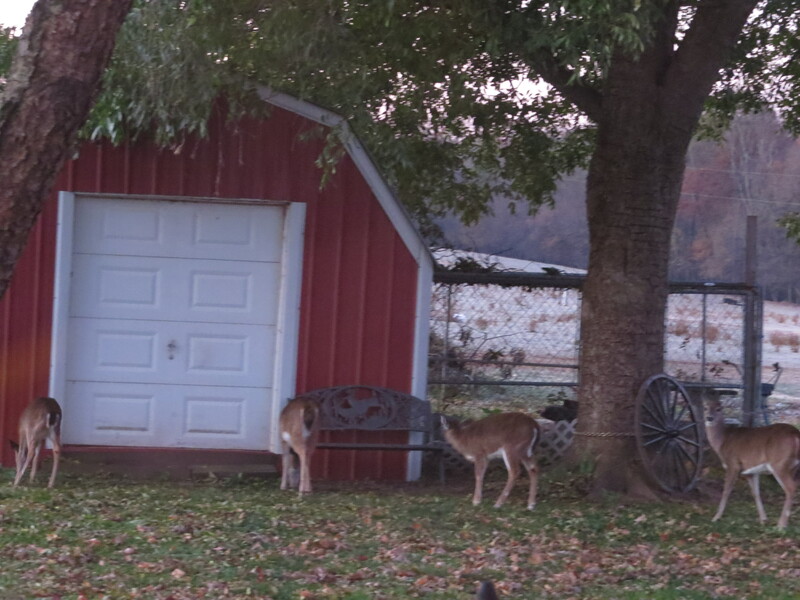 He enticed them in the corral area in the back pasture last evening. 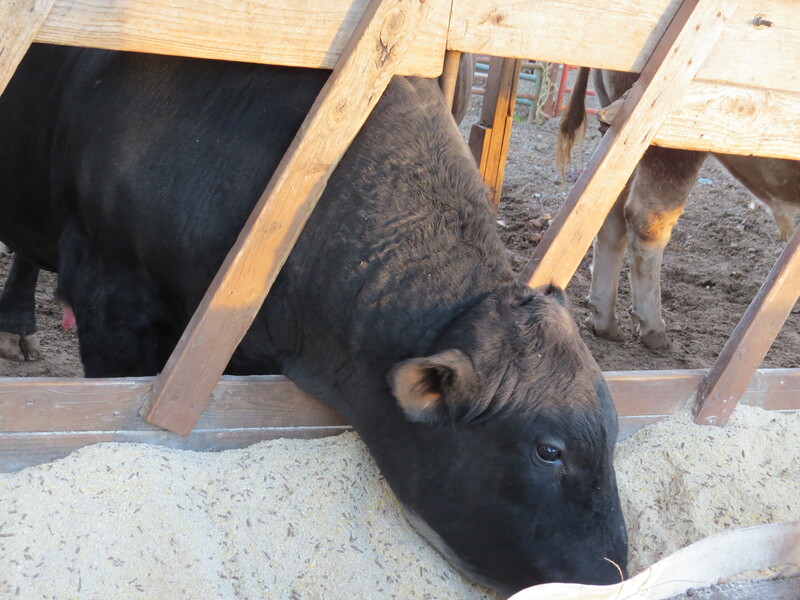 He had been feeding them at the corral for several weeks so that they would be easy to catch. 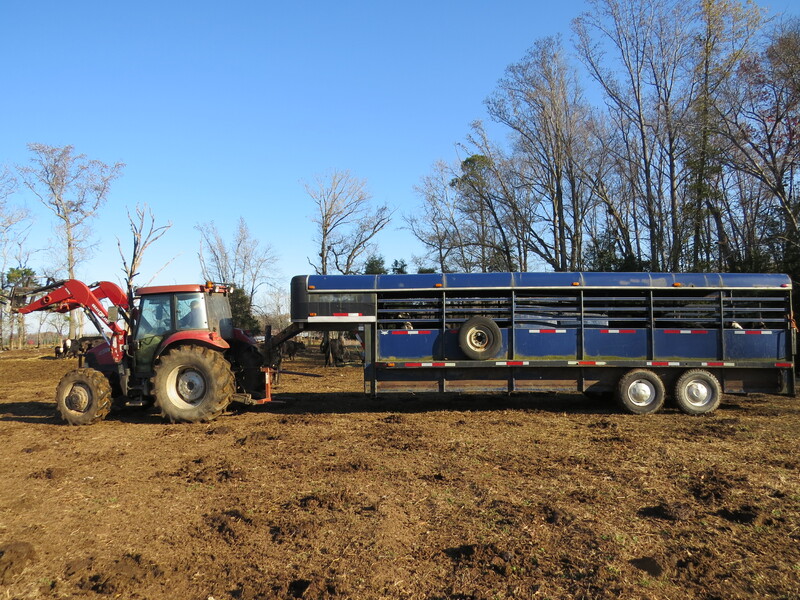 He used his cattle trailer to transport them the approximate quarter-mile from the back pasture to a pen close to the barn and his feed lot area. 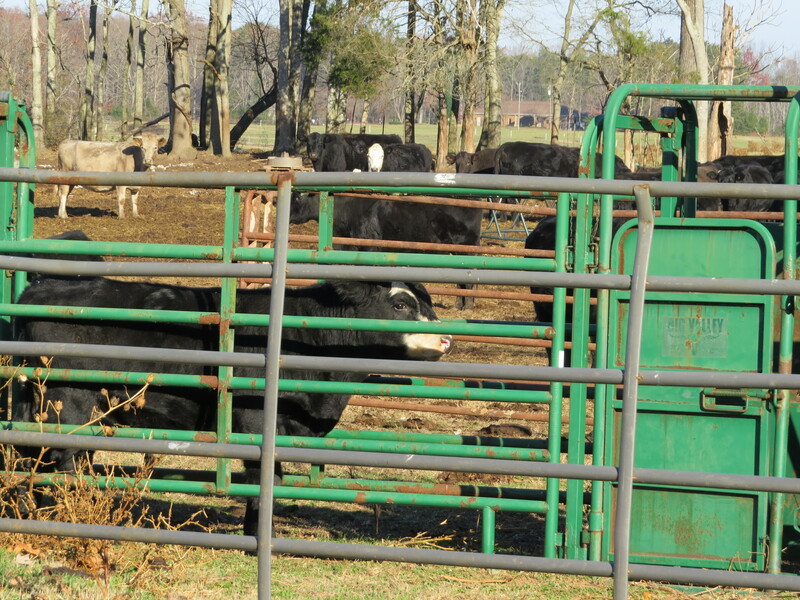 It always makes me a little nervous when they are working cattle because anything can go wrong. I mean anything. If you remember, I do have my very own bull story and lived to tell it! Because they are enclosed into a small area the cattle are restless and nervous. They are very easily spooked and will do the wildest, most foolish things imaginable! They can go under gates, through fences, over gates, get stuck in a panel or bolt for freedom. You do not want to find yourself in a corner with no way of escape. 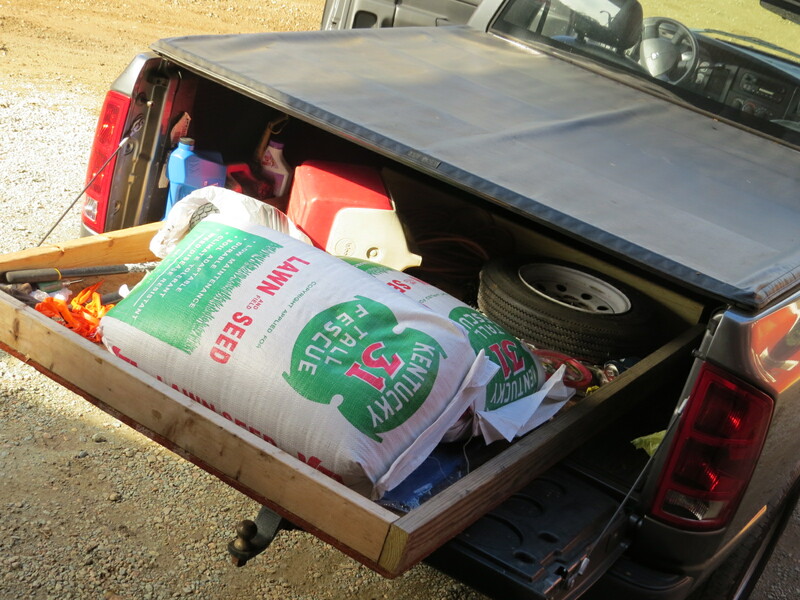 You have to have everything thought through; all your gates lined up with the trailer properly and easy to close. 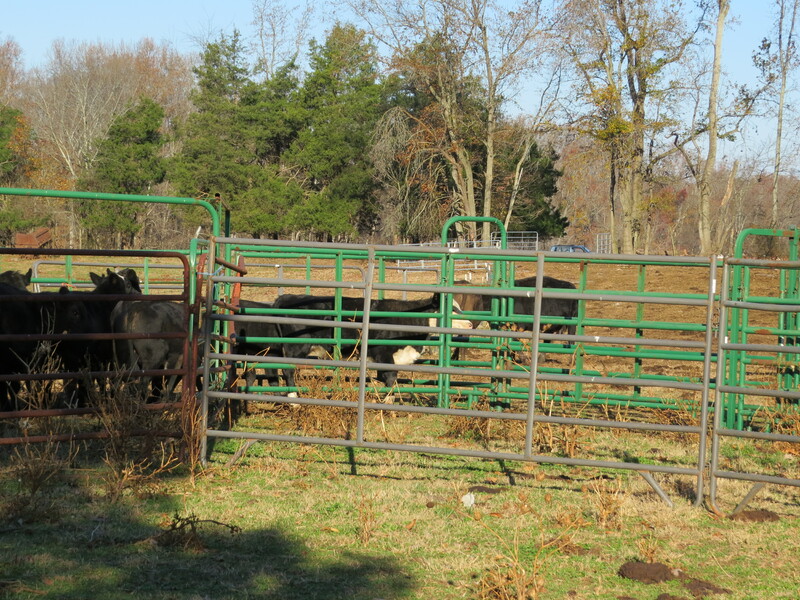 Gene has given his corral area a lot of thought and the cattle usually move smoothly and without too much trouble. Today was one of those good days and all three loads were moved without incident. Sam is helping Gene today. 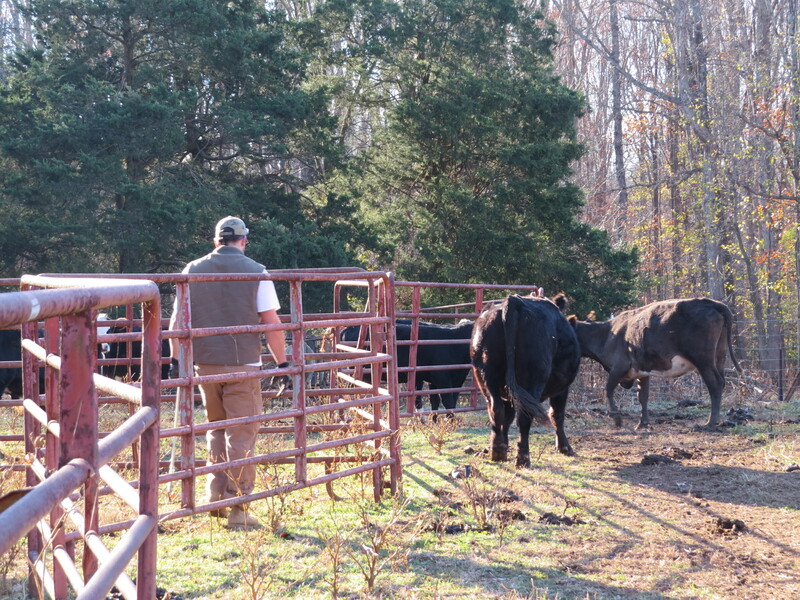 Gene works his cattle quietly, moving them gently but firmly. 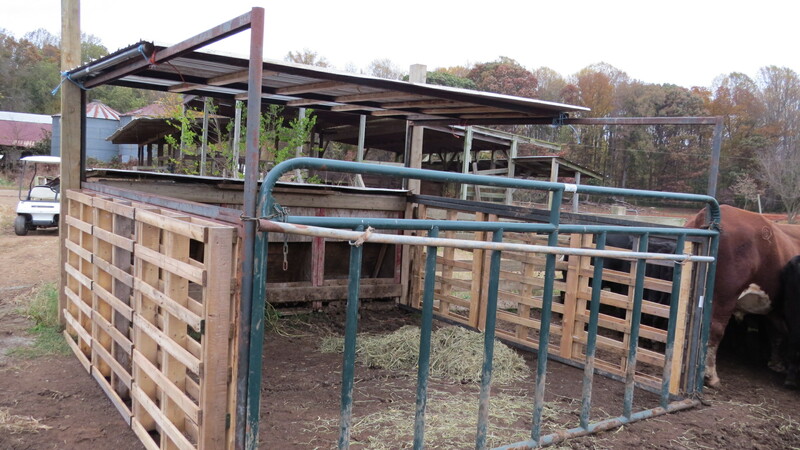 His pen is set up in a circular movement that is natural for the cattle and he can close gates as he goes to keep the cattle from back-tracking. These two mama cows were very concerned that they could not get to their babies and were frantically talking about it! 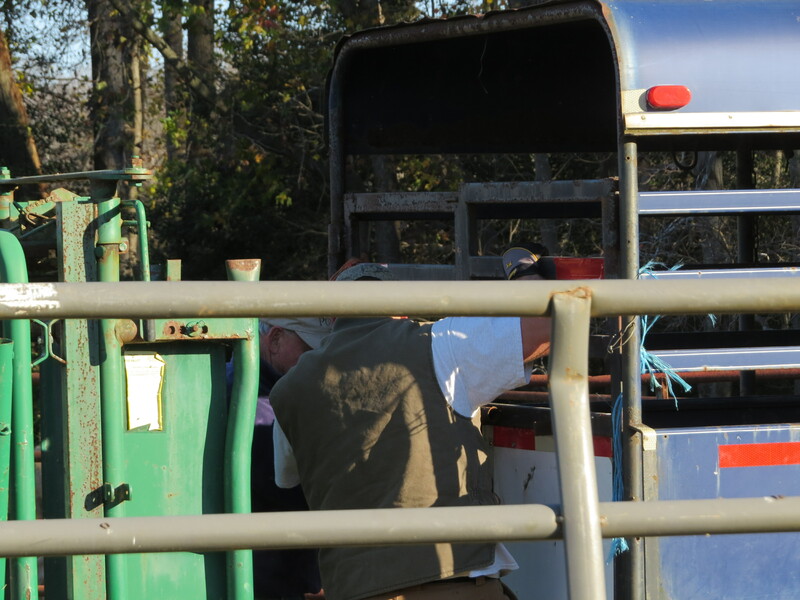 As the cattle are moved around the corral they enter a narrow chute area that takes them up onto the trailer. At this point you want to keep them moving fairly quickly so that they don’t have time to turn around and bolt back off the truck. When they do you have an instantly unloaded trailer and a mess as the cattle are now upset! When the last one is one the truck the gate is very quickly shut and secured. 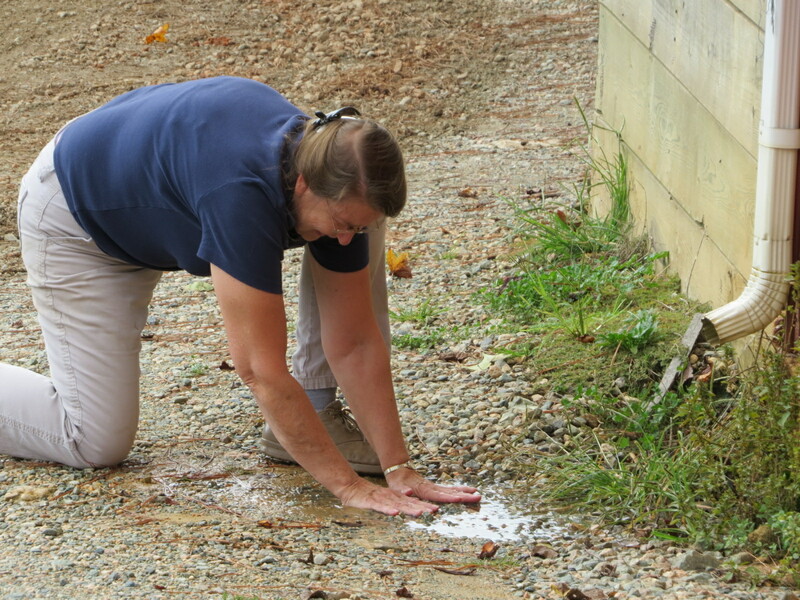 Katie, the Border Collie, thinks she is the one who has done all the work! 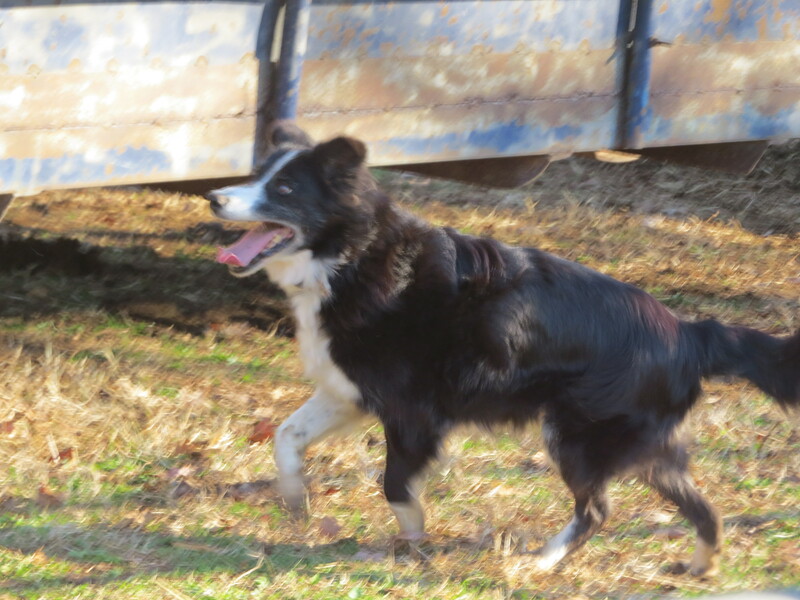 She gets so excited when we are working cattle and forgets to limp on her back leg that she injured when she ran in front of the golf cart and tangled with the wheels. She did not win! The mama’s watching their babies leave. 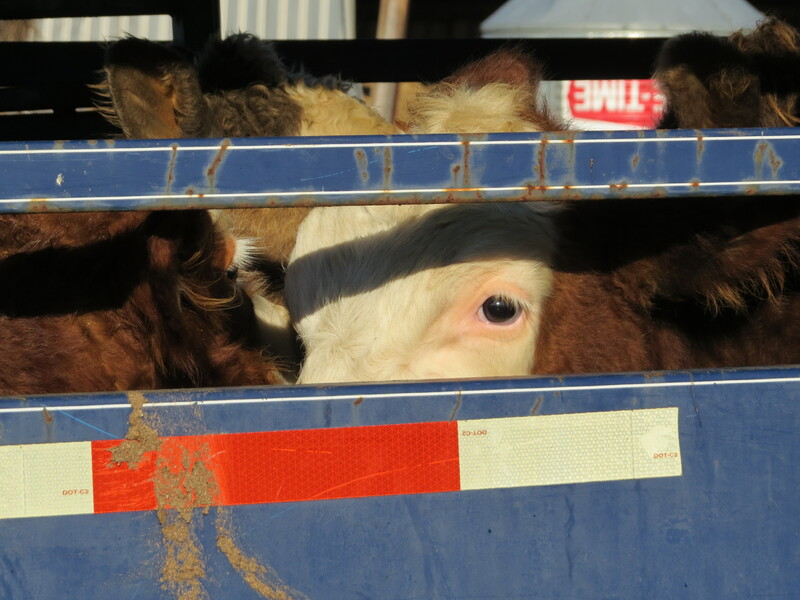 When the door on the back of the trailer is open the calves bounded off, kicking their heels. 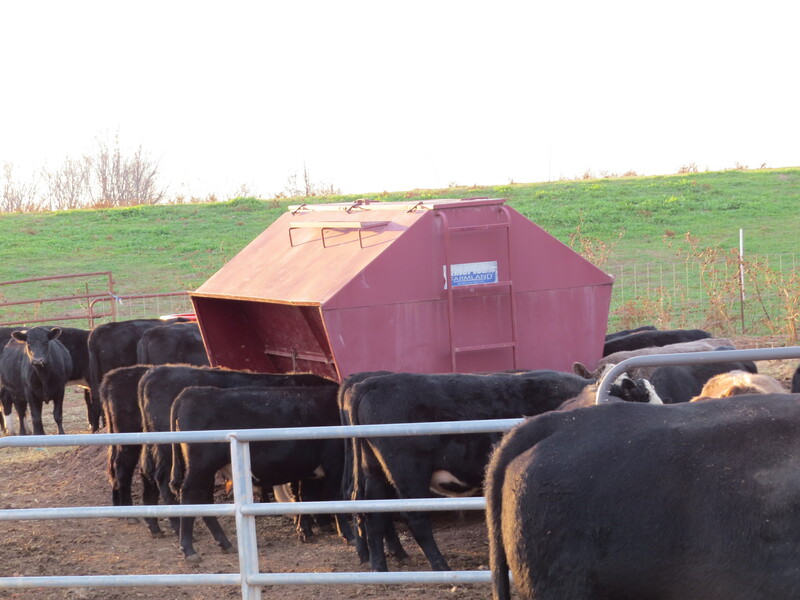 Gene had the pen ready for the calves with a creep feeder full of Purina Accuration. 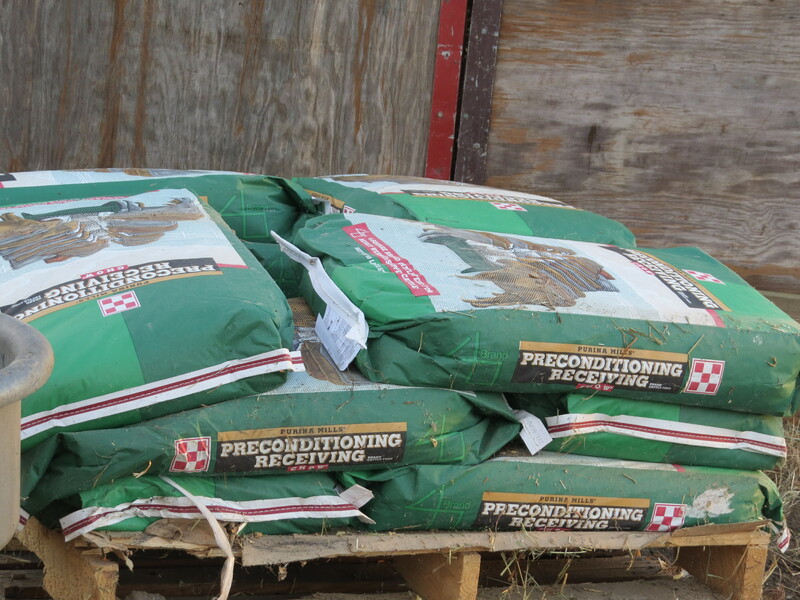 A tub of Purina Wind and Rain minerals. 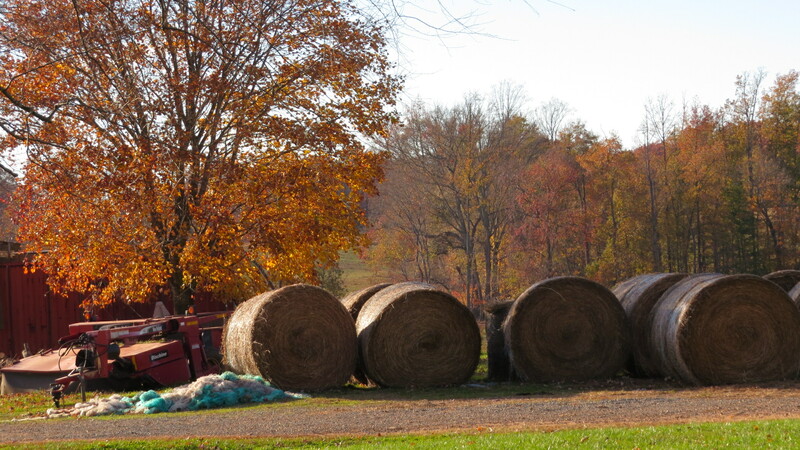 A round bale of hay. They made fast work on this bale of hay. I took the picture several hours after the calves were moved and they had started with a full bale of hay! 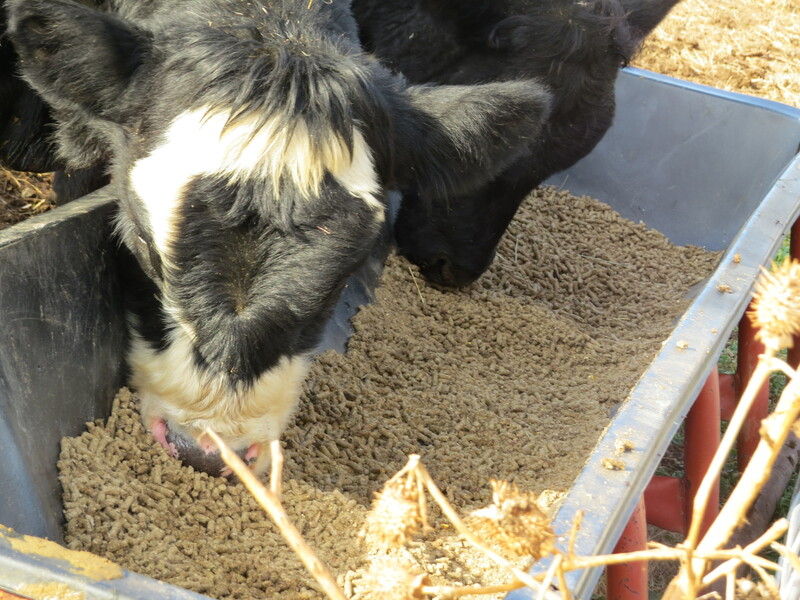 And a trough full of Preconditioning Chow to help with their adjustment of being taken from their mamas. It didn’t take long for them to fill up their bellies. King of the mountain! 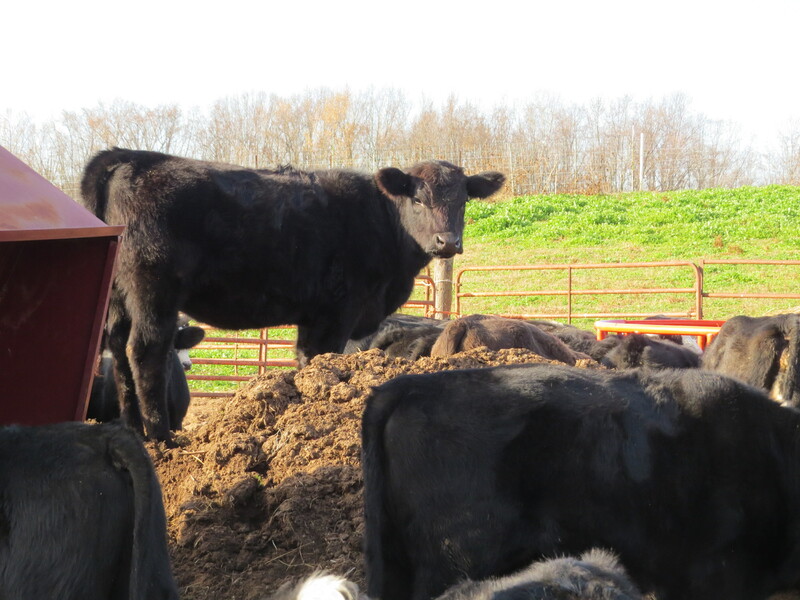 Just like kids, cattle love a pile of dirt. 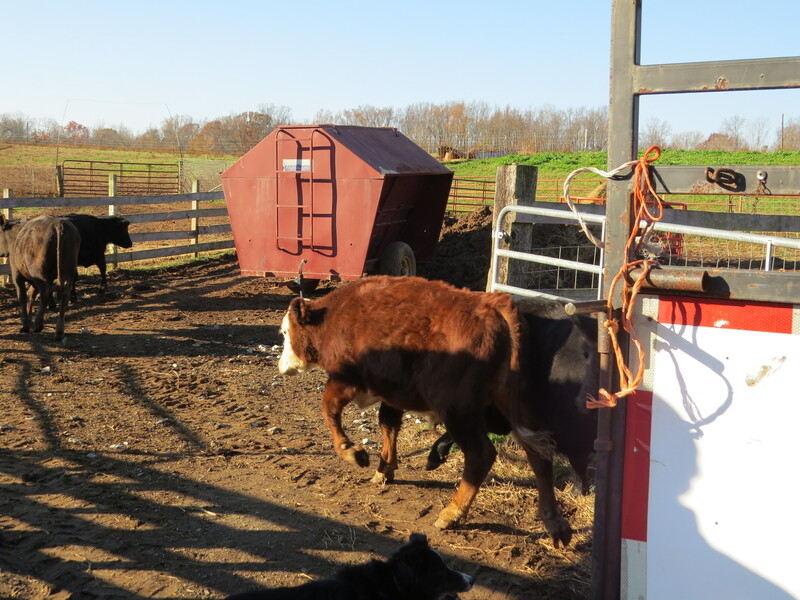 The calves seemed to adjust quickly and did not seem to mind the move. I asked Gene this evening how they were doing and he said only two were missing mama. Most of these calves were older and had already been weaned naturally. I remembered there were only two mamas that seemed upset when we were loading them. 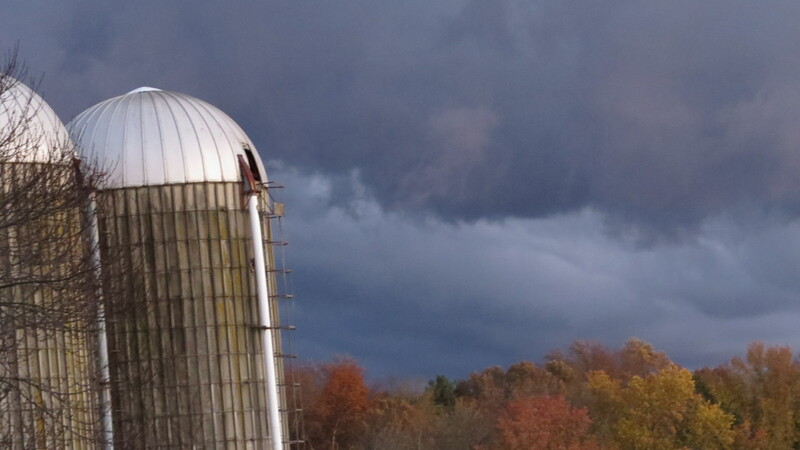 We are not hearing any noise from the feed lot this evening. It should be a night of peace and quiet! Some of these heifers will be replacements to go back into the herd. 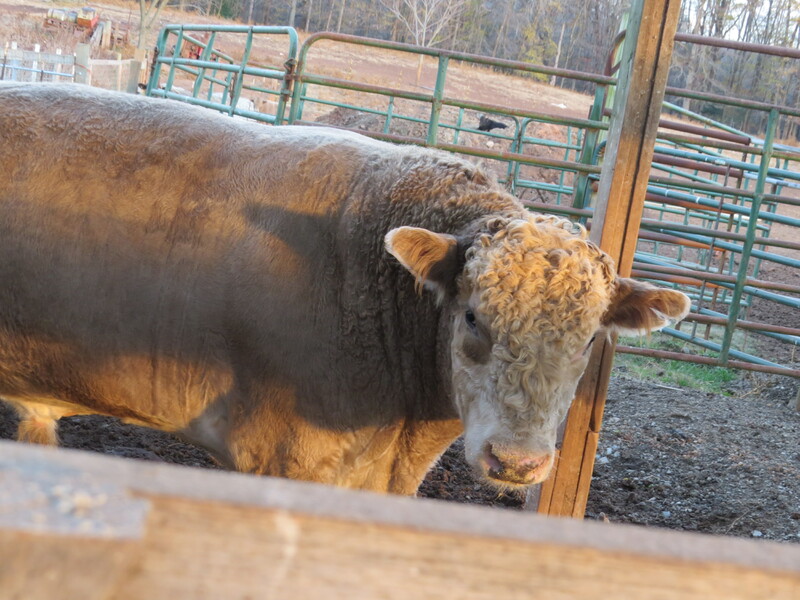 Some will be back-grounded and some of the bulls will go into the finishing feed lot with these big boys with an all-you-can buffet! 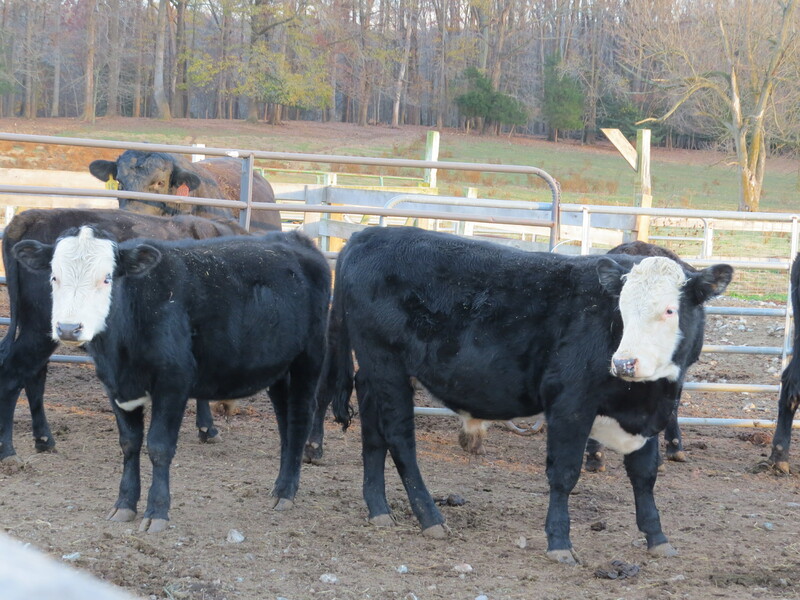 We have names for these like Ribeye, T-Bone, Burger, and Chuck-Hertzler’s Finest Beef in the making!!! 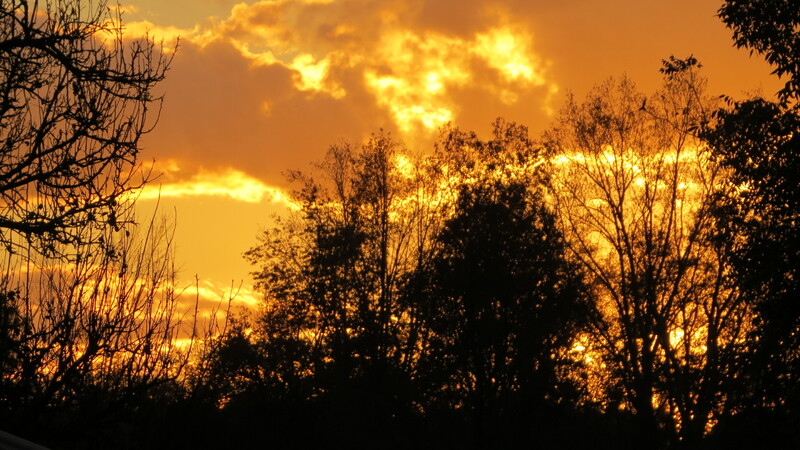 This afternoon I took a ride on the golf cart over the fields of the farm looking for whatever I could see and just enjoying the gorgeous, warm, fall afternoon. 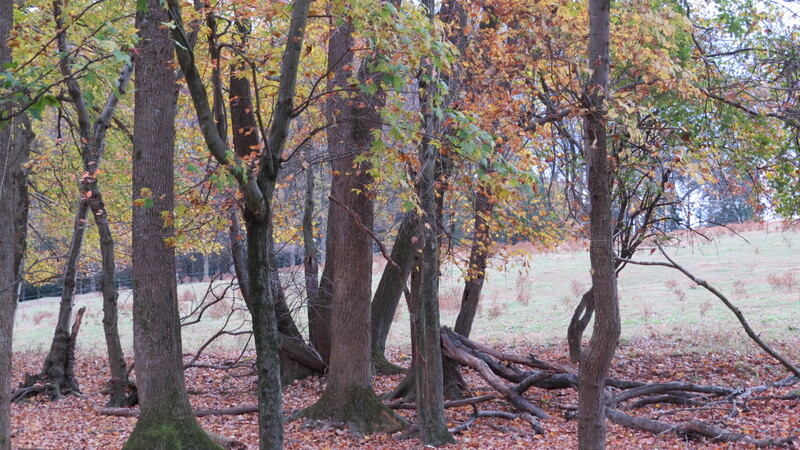 On the far corner of the farm, just across the fence is an old forgotten cemetery nestled in the woods. It beckoned me to come visit. I laid on the ground and rolled under the fence. Two strands of electric fence separate the site from our pasture field. It has been several years since I visited the site. The last time I was there, the temporary markers were still in tack bearing the names and dates of the deceased. 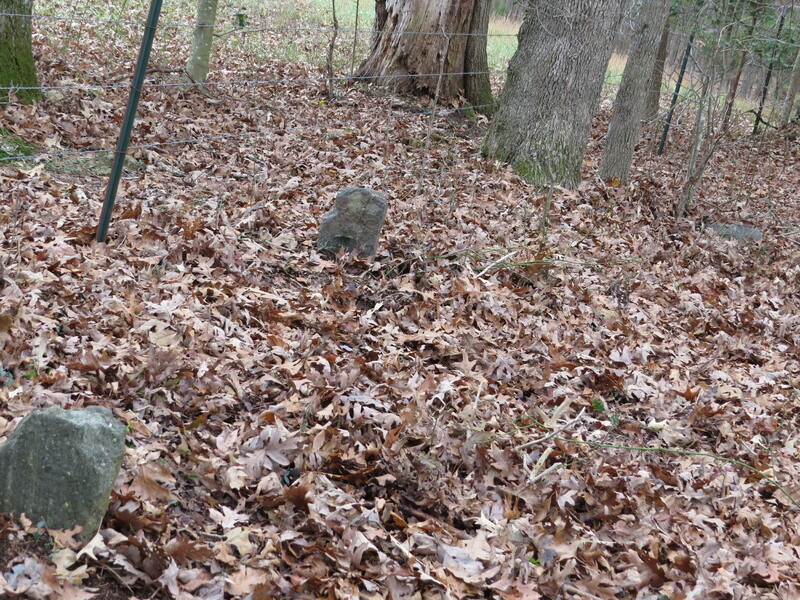 There are three rocks set upright in the ground as head stones. 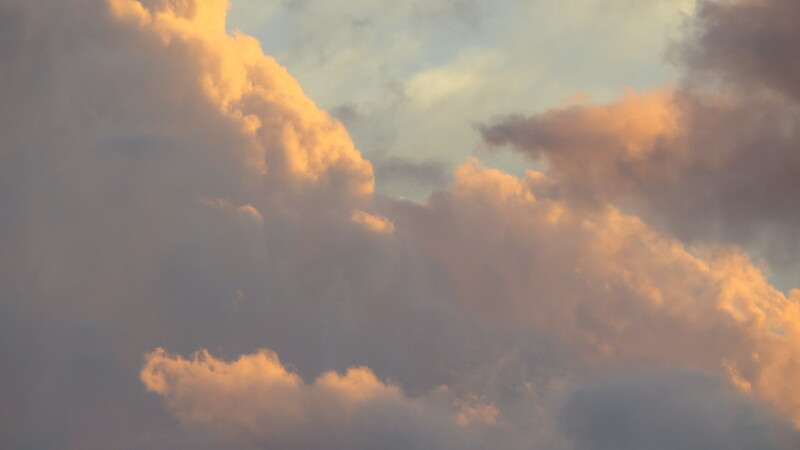 (The third one is along the edge on the right side of the picture). 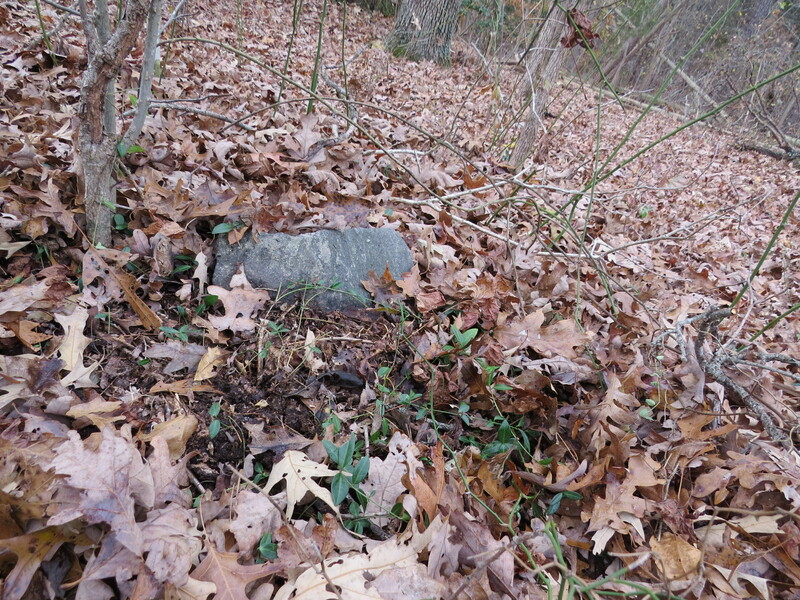 There are several sunken depressions in the ground where I know are other unmarked graves. 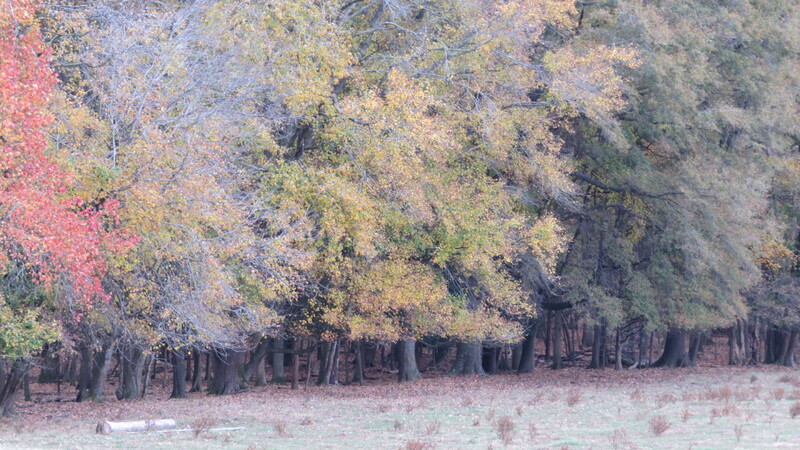 A thick coating of leaves covered the ground. I carefully took my foot and tried to clear around each stone hoping to find the markers so I could take a picture for history’s sake. I could not find them. Maybe one day I will take a rake and see if by chance I can locate at least one of them. Underneath the leaves I uncovered little green sprigs of ivy. Somehow this seemed so appropriate. 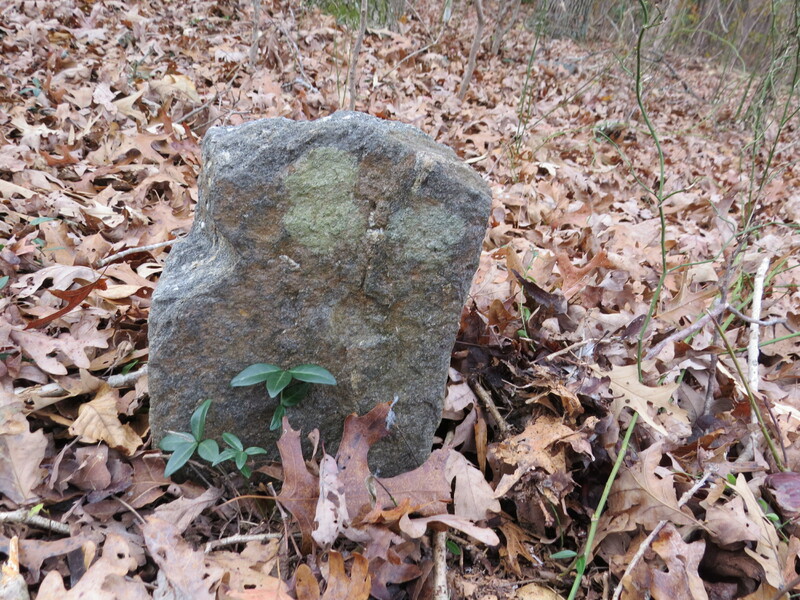 The stones mark the spot of someone’s remains. This was a spot of deep grief for a family as they laid their loved ones to rest. Who were these families? If I remember correctly their last name was Brown and they were buried in the 50’s. . I wish so much I had written that information down. 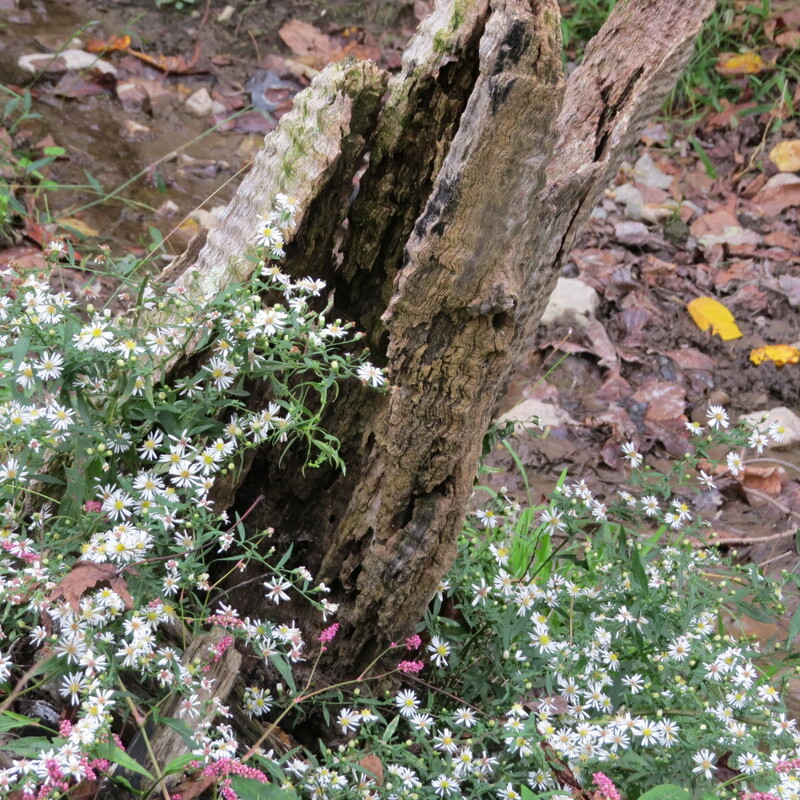 My mind wondered about this peaceful, quiet, resting place. Is this a family plot? Did they live on our farm or the neighboring farm? We know a road used to go past out house, and wove it’s way across the back pasture and creek, across our neighbor, William Thornton’s land to Rocky Ford Road. We know where there were several house sites, long gone. Each grave holds the story of a life lived, someone’s loved ones. Are there now grandchildren who would love to know where Grandpa and Grandma were buried? It appears they are now forgotten, lost to the elements of time. Rest in peace my friends. Rest in peace. 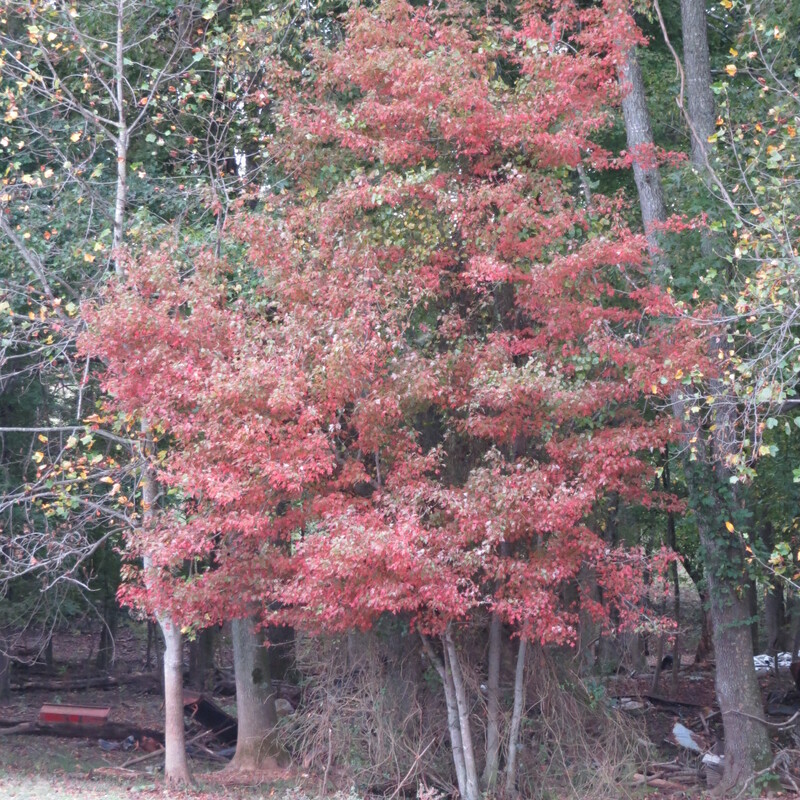 Fall is a gorgeous time of year-and is a competitive rival for spring as my favorite! 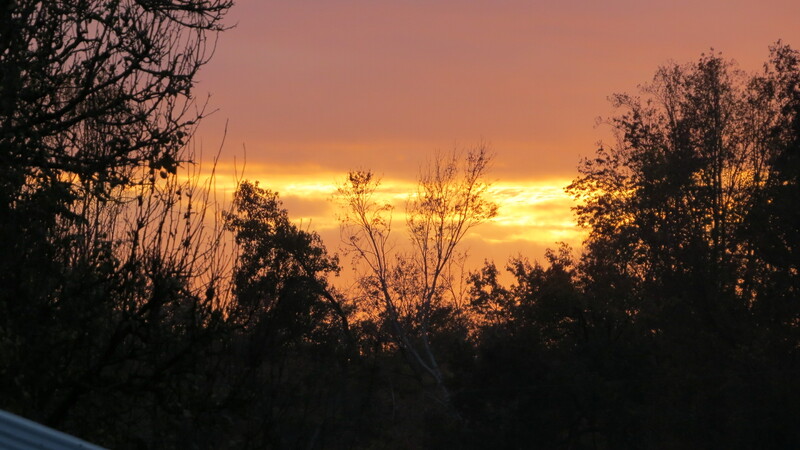 There are so many pictures on the farm to capture from sunrises to sunsets, leaves, and flowers. Some late blooming summer flowers. 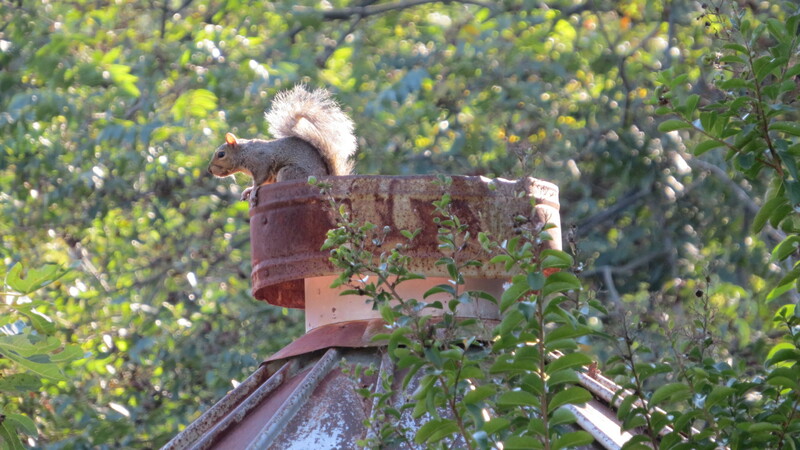 A busy, chattering squirrel enjoying the warmth of a sunny afternoon. 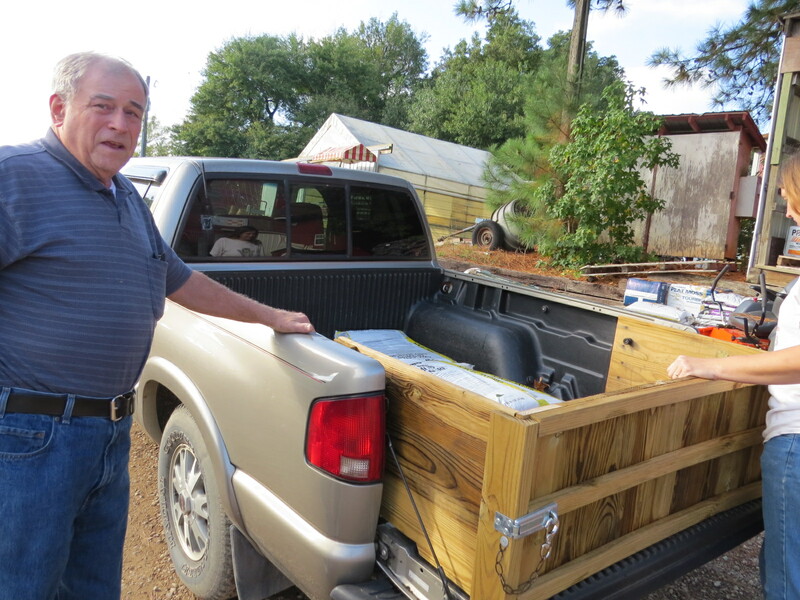 Gene has been busy getting his cattle pens, feeders and fences ready for winter. 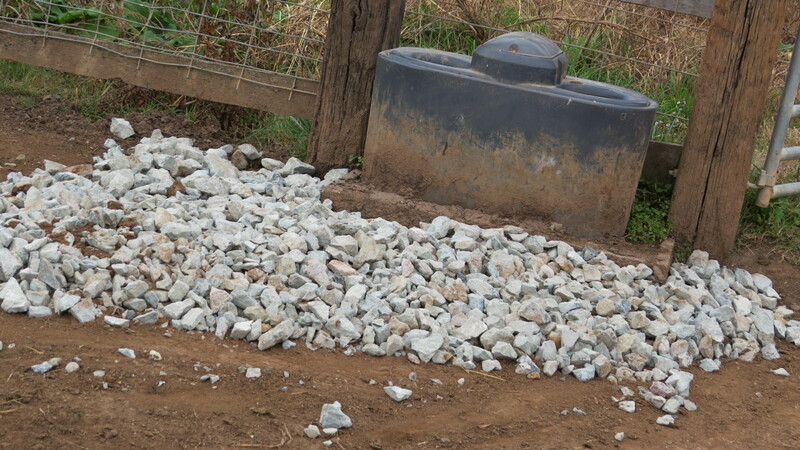 Gene put rock around the automatic cow waterer to help with mud during the winter months. 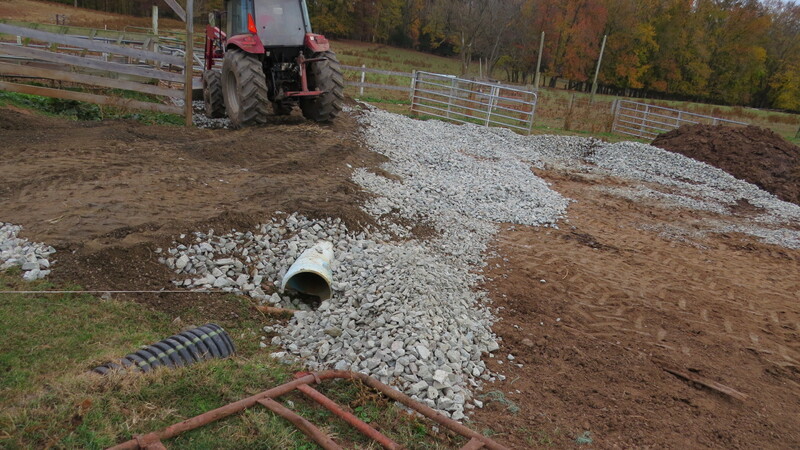 Putting a drain and gravel in a potential muddy area. 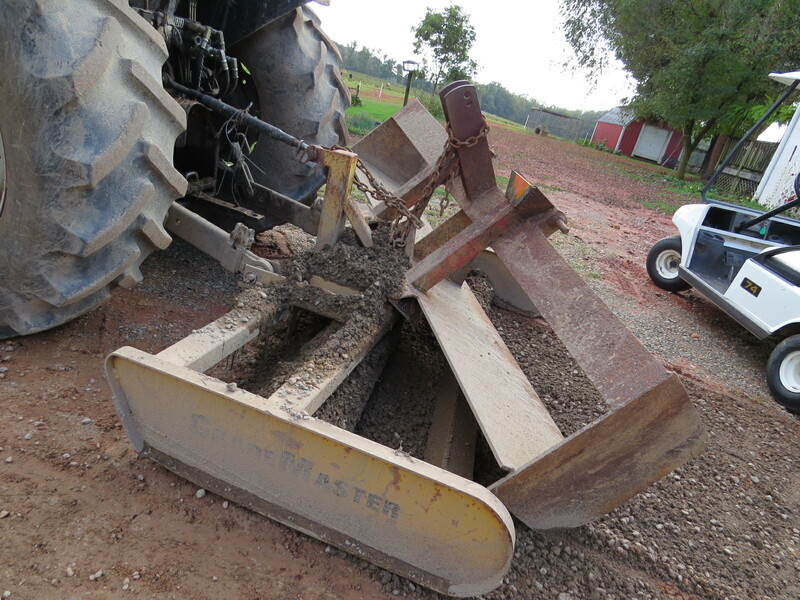 Working on a gate post-trying to straighten it. 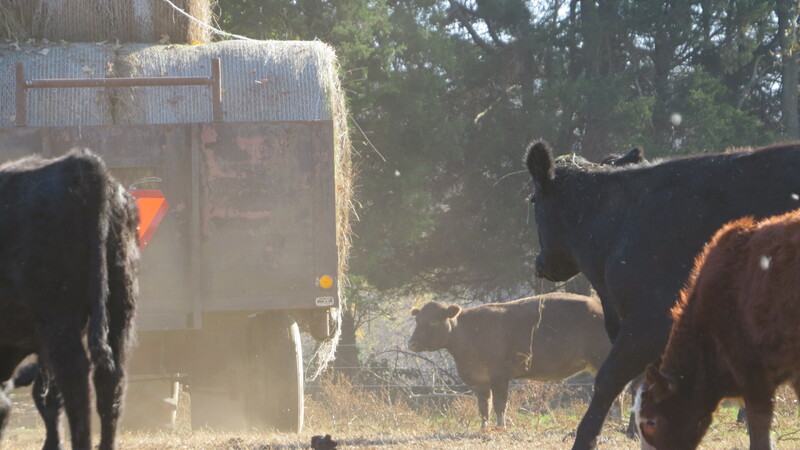 The cows were all excited about a load of hay coming in. They followed, stirring up dust and mooed! 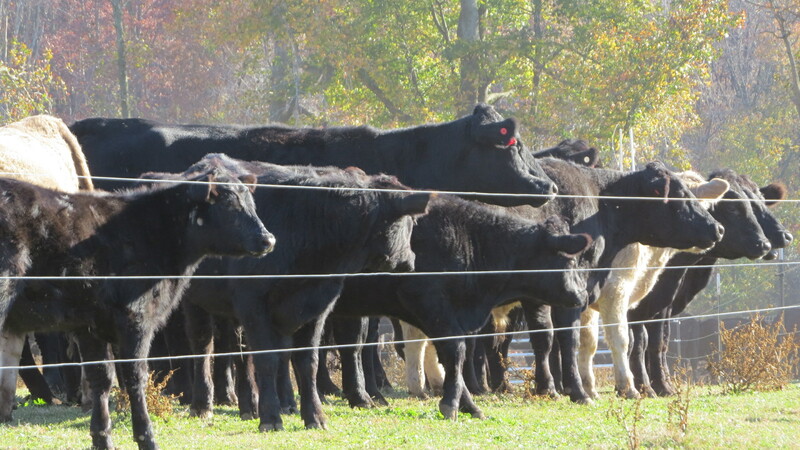 The cows in the next field all lined up along the fence to watch and wish! 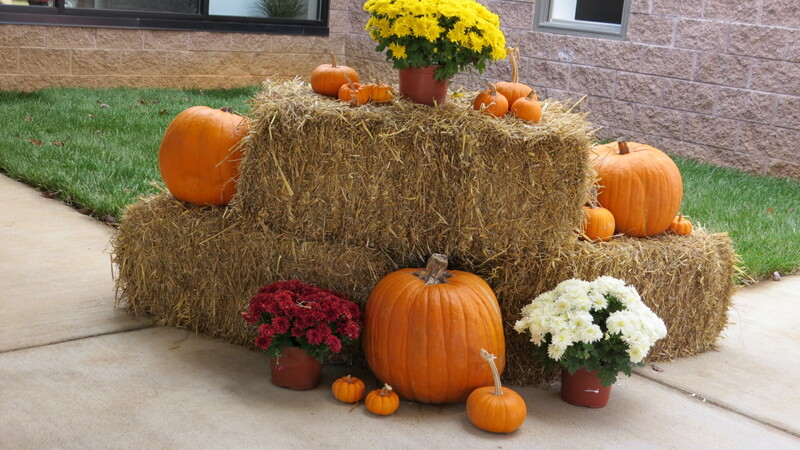 Beautiful fall decorations at church. 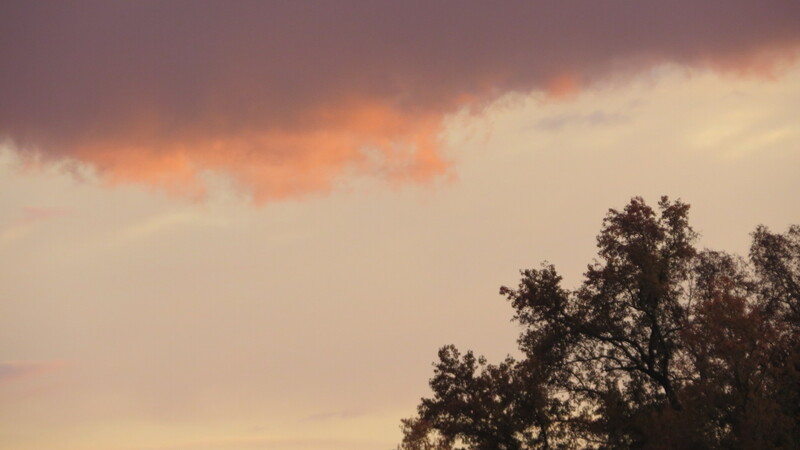 I love the rich colors of autumn. Deer in our yard about 60 feet from the house. It is the first time in 41 years that we have seen this. 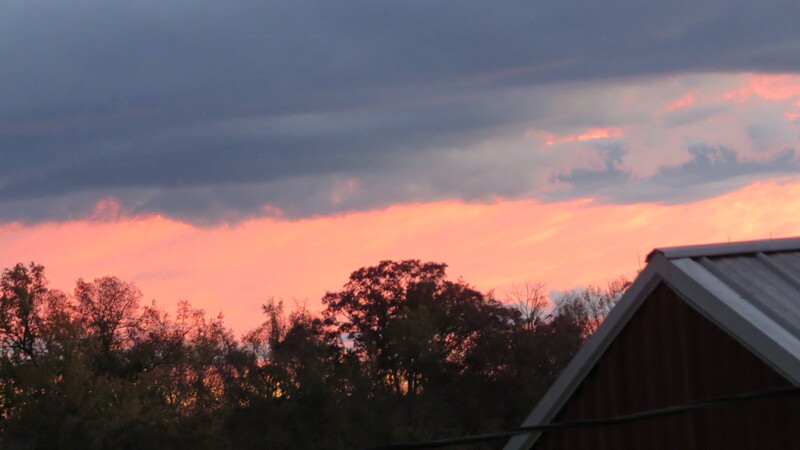 The sunsets and sky always seem exceptionally awesome in the fall. 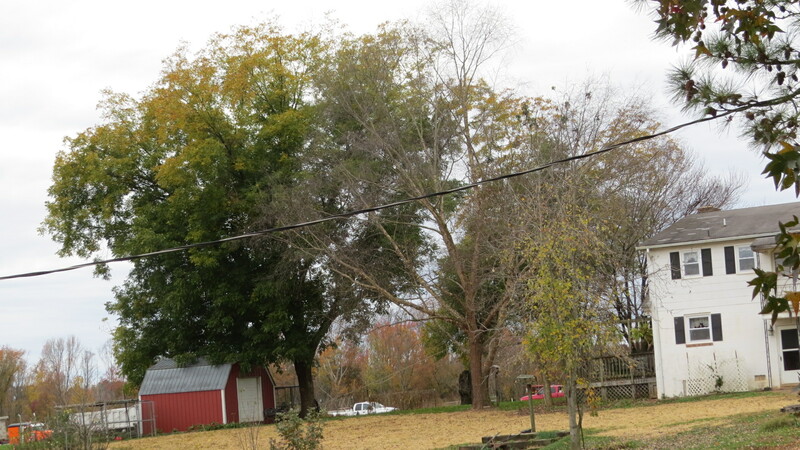 The pecan trees are still green with just a tint of yellow. 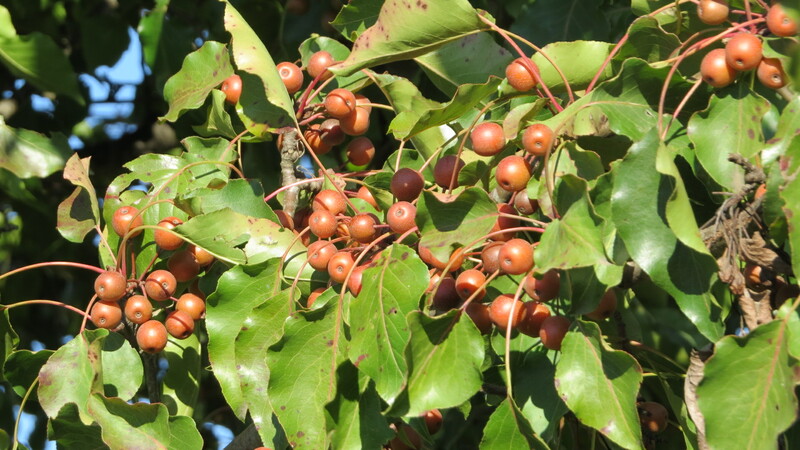 They are the last to bloom and get their leaves in the spring and the last to drop them in the fall. 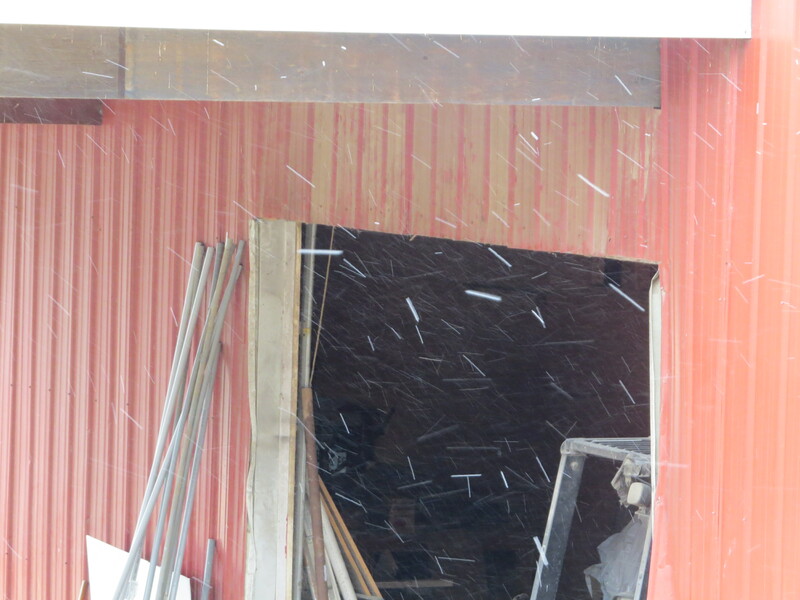 And today- 11/12/13 we had the first snow flurries of the season! There is a lot about our human nature that we can learn from animals. 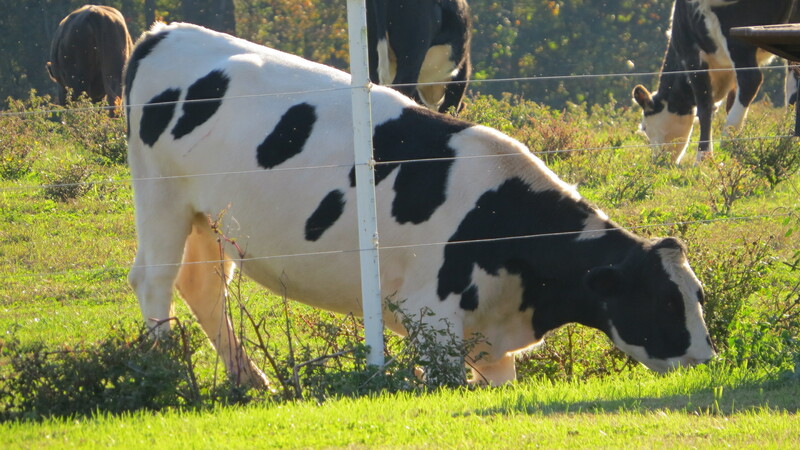 This cow-she is the only Holstein-looking cow in our beef herd- is always on her knees with her head stuck underneath the fence trying to eat what is not in the field. And no, she is not praying! It does not matter which field she is in, she is at the fence line on her knees. I have watched her. She will eat, back up slightly, get up off her knees, move a few inches and down she goes again, with her head stretched out as far as she can reach. And don’t dare leave a gate open, she will find it. 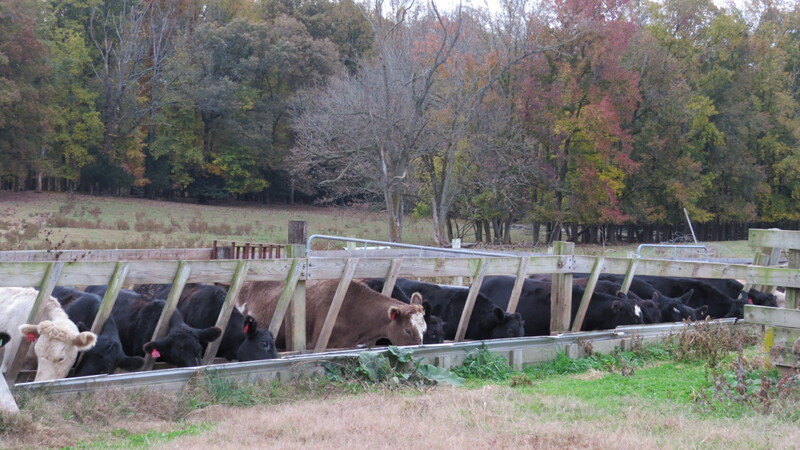 The other day I was watching the cows eat at the feed trough. They were lined up in a row, neatly spaced. 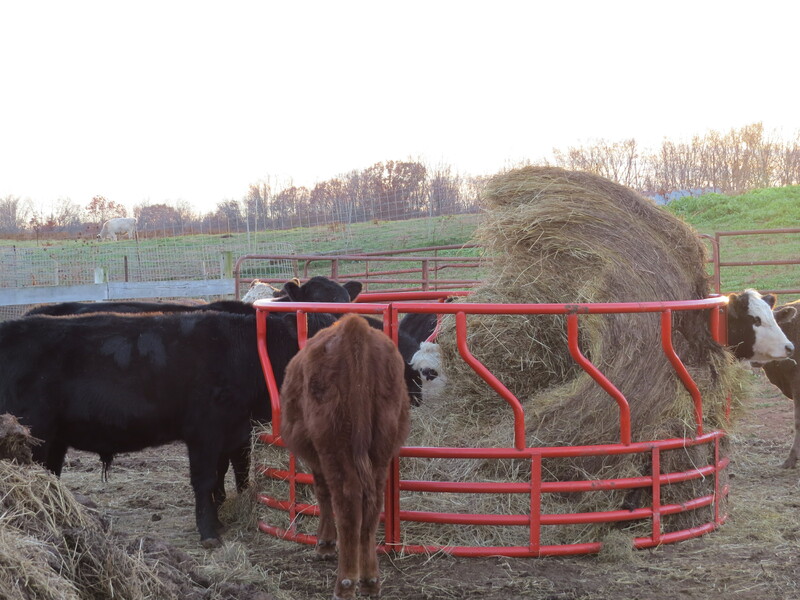 There are slats in the fence line to help keep each cow in their spot. Usually the cows will eat at the same spot or close to it. These two cows were eating their neighbors food. Obviously they have not read Ten Commandment number 8 and number 10. 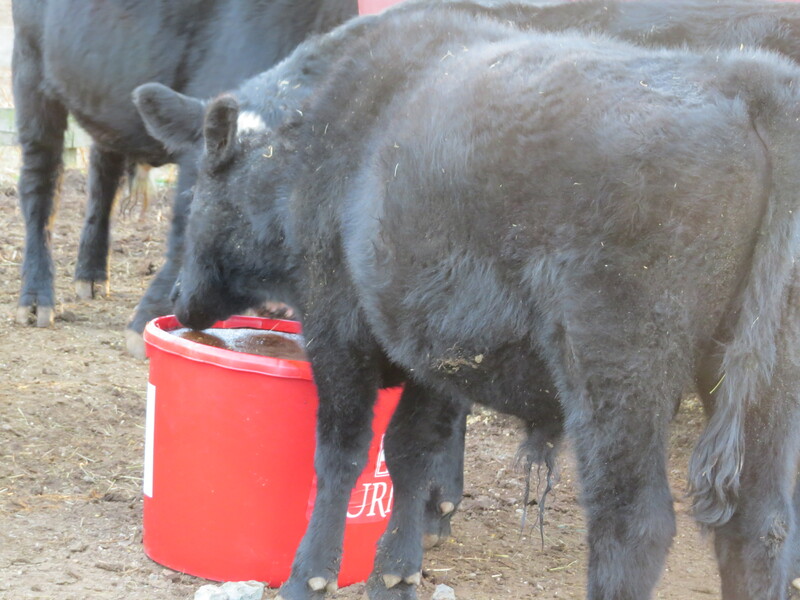 Even though there was still feed in front of the cow, she was stretching her neck and tongue to reach what was not hers. She wanted more. She wanted her neighbors food! I have been thinking about these pictures and wondering, am I like that? Do I want what is not mine? Do I always want what my neighbor has? Am I satisfied with what is on my side of the fence? Of course I am, it is you that I can point a finger at. Sadly that is not true. As Americans we have an insatiable appetite for more, bigger, better, and newer. We justify spending more money to save money because it will save us time. Figure that one out! 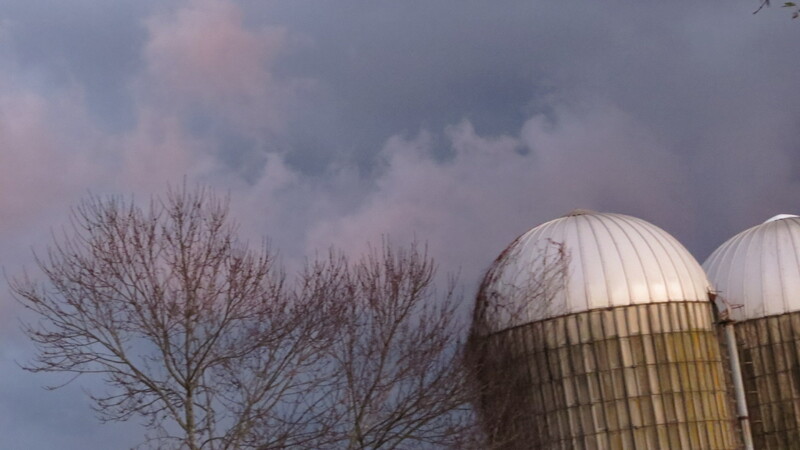 This spring I brought a new camera. I wanted one that was better than just “point and shoot” like I had. 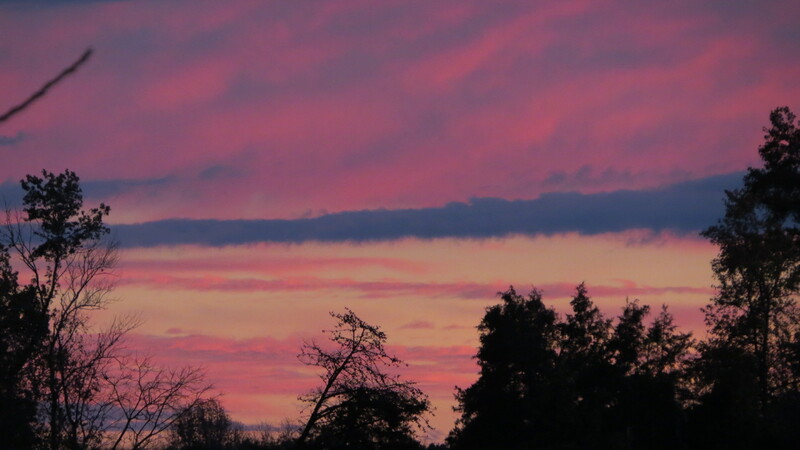 I have been so pleased with my new Canon SX50HS. But guess what? Now I really wish I had gotten the next step up so I can do more! I really would like an addition to the house so I could entertain…not more but better! If the speed limit is 65, I go 69. If it is 70, I set the cruise control for 74. I push the limits but don’t want to get caught and mutter about the person passing me, secretly hoping that he will go through radar! Sometimes I struggle with liking the best, biggest and newest. I like quality and quantity. I wish, I want, I would like, I need…..! Am I alone? When I write it on paper it sounds pathetic, selfish and greedy. 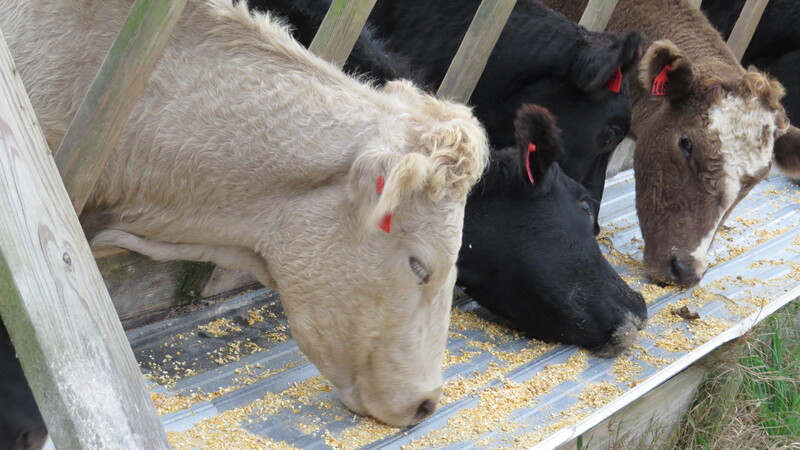 When I go back and look at the pictures I see there are other cows in the pictures that are eating contently even when what they have is taken away. They seem to be tolerating the greedy cow without a whim. The Apostle Paul gave us some advice from his personal experiences….. “for I have learned in whatever state I am, to be content” (Philippians 4: 11). Contentment brings gratitude and gratitude bubbles forth with thanksgiving. 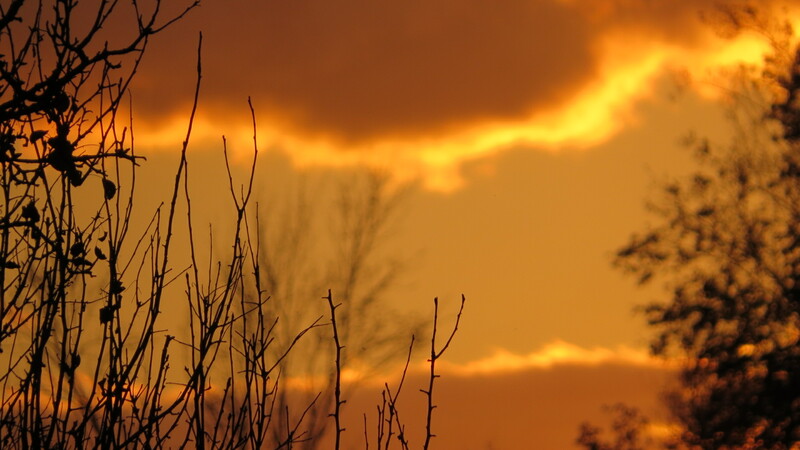 When our longing, hungry, empty, covetous soul is filled with God’s goodness we are satisfied. Yes, we still have needs and wants but there is a check to our desires. 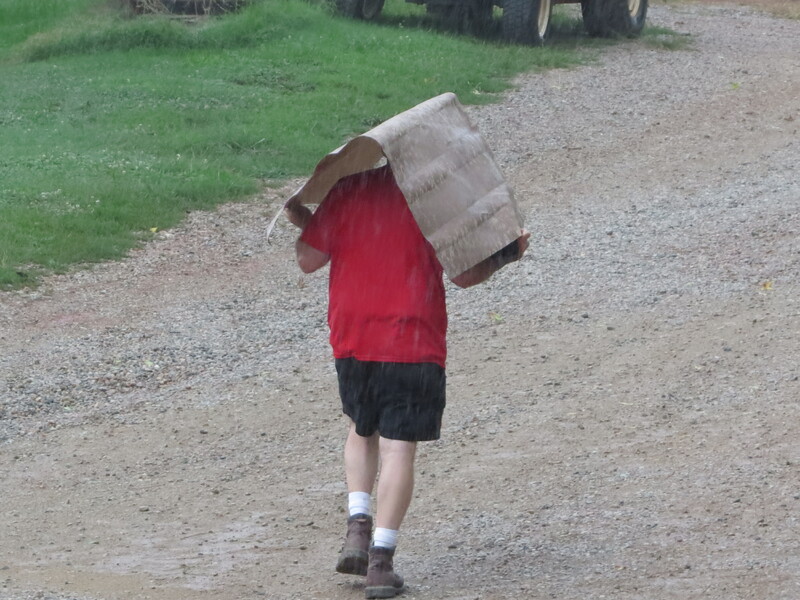 There are some things country folks do…..enjoy and laugh! 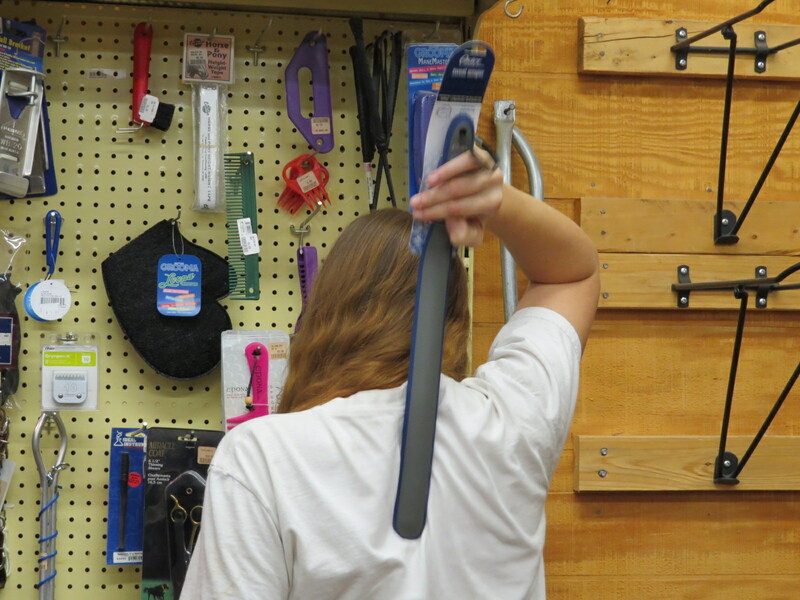 Got an itch….scratch it this way…. 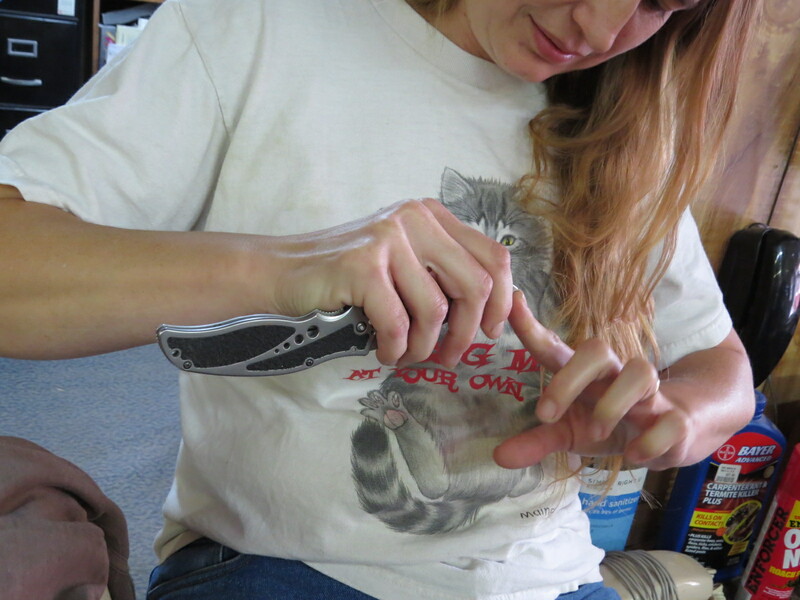 Who needs a nail file when a knife will do! 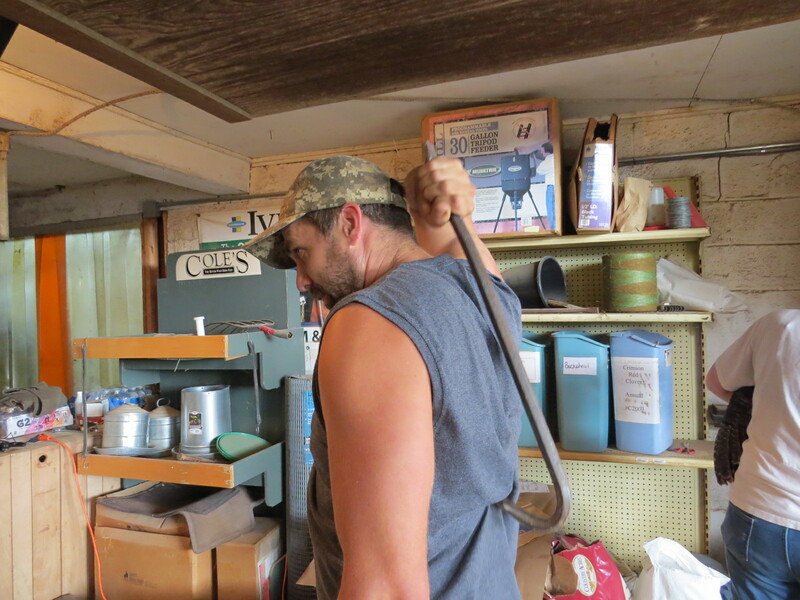 Need extra weight…. add another piece of equipment! or reach your stuff at the front? 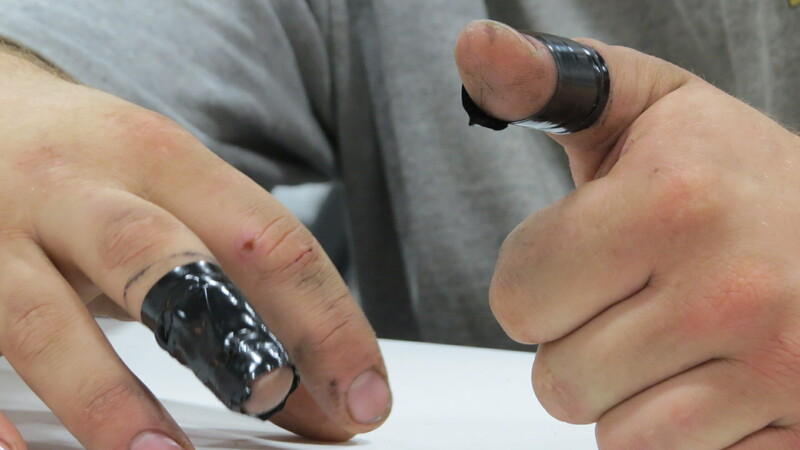 Electrical tape works just fine!